INCHEON, SOUTH KOREA--(Business Wire) October 28, 2016 -- The third largest giant city with population of over 3 million is created in Korea that has a 50 million-population. As it exceeded 3 million in population as of October 19th, 2016, Incheon City has grown as a city with 3 million-population in 36 years of its history, next to Seoul and Busan. The population of a city is one of important indicators that determine its strength. Under the situation where competitiveness of many nations and cities worldwide is likely to weaken due to demographic cliff, the increase in population to over 3 million means that it has the driving force of growth, standing comparison with major cities of the world. In the United States with larger than 300 million of population, only two cities, New York and Los Angeles, have the population of over 3 million each, and other comparable cities are Berlin (3.5 million), Germany and Madrid (3.2 million), Spain. Given the current trend of population in Korea where the society is rapidly aging, it is uncommon for Incheon to grow into such a large city in size of population because some experts predict that no other cities will do so in the future. Main factor of increasing the population in Incheon is the influx of population from other parts of the country, among others. While the population in Seoul and Busan is in the decreasing trend that in Incheon is on the steady rise thanks to price competitive residential environment comparing to Seoul, increased new jobs and convenient transportation. Incheon has grown into one of major cities in Northeast Asia by leveraging the international airport opened in 2001 and construction of the first free economic zone in Korea. Located in the region that can be reached within 2 hours by air in distance of less than 1,000 kilometers in radius from 84 cities with a population of over 1 million, Incheon provides optimal conditions as a center of tourism and business with an international airport, ports, 168 islands and the sea as well as the best free economic zone, comprising Songdo, Cheongra and Yeongjong districts. Historically, Incheon is the first gateway to Korea for trade with foreign countries as the first port. It first started baseball and football games while the first railroad and Western-style hotel were built. It is widely known to foreign people as the historical site of landing operation during the Korean War, called ‘Operation Chromite’ as recently reproduced by a film of the same title. Also, the image of the city was effectively promoted in the world by hosting the Asian Games in 2014 and the 2015 President’s Cup golf tournament. Celebrating the era of 3 million-population, Incheon is moving fast to achieve its goal. With commitment to proactively leading development of Korea by maximizing its historical and geographic features, the city aims to rise to one of the world top 10 cities by 2050 from 56th city as of 2012. 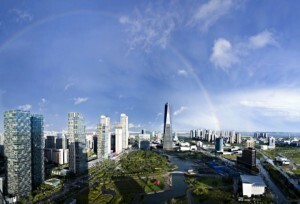 Incheon was named by EIU* as the city with the ‘second greatest growth potential’ in the world and it was selected as the safest city in a survey on crime and safety in 2016 conducted by Numbeo, a world prominent site of comparing cities and nations, outpacing Tokyo (second in rank) and Seoul (third in rank). Taking account of its geopolitical status in the pan-Yellow Sea rim, Incheon is expected to play greater role as the pivotal international city. *EIU: Economist Intelligence Unit, research arm of The Economist Group, a weekly magazine in the United Kingdom.